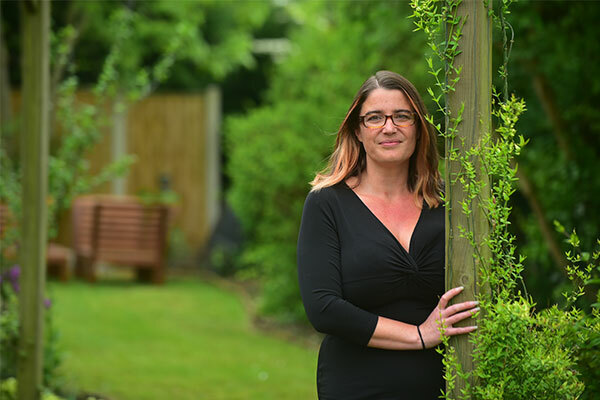 On World Alzheimer’s Day, Alzheimer’s Research UK supporter Sophie Leggett explains why she is determined to use her experience of dementia to make a positive difference to future generations by taking part in vital research. Sophie has a 50 per cent risk of developing early-onset Alzheimer’s due to a rare faulty gene which runs in her family. Less than one per cent of Alzheimer’s cases are due to an inherited gene. It’s hard to believe that you can find a positive in knowing that you have a 50/50 chance of developing Alzheimer’s in your 40s but that’s just what happened to me almost five years ago. I had lost my mum to this heartbreaking disease at the beginning of 2012, and watching her fade away both mentally and physically in the years before this had devastated me. I found myself avoiding visiting her. To watch a parent becoming less and less of the person that they once were is truly t terrible and being faced with the chance that my future would be exactly the same was terrifying. My auntie had also developed Alzheimer’s in her 40s and in my heart of hearts I knew that this was a very rare genetic form of Alzheimer’s. When I did visit Mum I was watching my future, Mum’s frightened face became mine as I looked at her, I imagined my family sitting at my bedside crying as I did. For many years I buried my head in the sand trying not to think about it. In the daytime that worked but at night I would have night terrors and wake up crying hysterically. When Mum died, we arranged for her brain to be donated to the brain bank for research into Alzheimer’s and somewhere in that process I realised that I had an opportunity to make some kind of difference to the future of everyone who may develop Alzheimer’s. It was as if a lightbulb had been switched on and I had found something priceless – HOPE! I got in touch with the Dementia Research Centre in London and within two months of Mum dying I was in London attending the Familial Alzheimer’s Disease Support group meeting, in a room full of people just like me, many of whom were already taking part in research. We talked together and cried together and I realised that I wasn’t alone. In May I was back in London for my first research visit – it was very emotional but I was doing something which was going to make a difference for future generations. I felt incredibly grateful that some good could come from my potentially faulty genes. In the summer of 2014 I got the long awaited news about the start of the DIAN-TU drug trial – a trial that seeks to discover if drugs given early enough to people at risk of having one of the rare gene mutations could delay the onset of symptoms or slow down the progression of the disease. I signed on the dotted line and committed to an annual week-long visit which involved cognitive tests, brain scans and a lumbar puncture and four-weekly visits to receive a dose of either the drug, if I have the faulty gene, or placebo if I don’t. I don’t know whether I have the Alzheimer’s gene or not as I have not had a genetic test, so I leave that part to the scientists. I’ve signed up to the study for at least four years, and have already completed my second year. 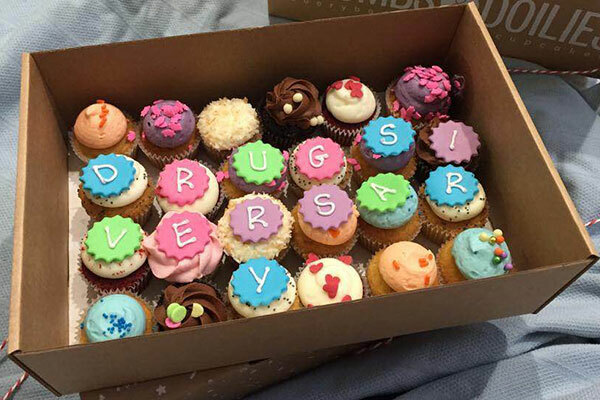 I call each year my ‘drugsiversary’ and celebrate with cake. Research is the positive that I found in a life that will always include Alzheimer’s, whether it’s me who gets it or other members of my family or my friends that I have met through research. Whatever happens in the future I know that research is the key to a world where Alzheimer’s isn’t the end, a future where it can be prevented or cured. I don’t expect to see that in my lifetime but I know that the more people get involved in research and the more money that goes into funding research, the sooner the day will come when our children and our grandchildren won’t need to fear this disease the way we do now. You don’t need to have a risk gene to get involved in dementia research. Alzheimer’s Research UK is in need of everyone, with or without dementia, for the world class studies it funds to find preventions and treatments for dementia. To register your interest in taking part in dementia research click here. You can even get involved from the comfort of your own home with the charity’s latest gaming app – Sea Hero Quest. Launched by Deutsche Telekom in partnership with Alzheimer’s Research UK and scientists from University College London and the University of East Anglia, the game already has two million participants, more than any other dementia research study in history. Just two minutes of gaming is equal to five hours of vital research.